Christmas Day: we arrive at Producer X's house where he greets us - he's in his early to mid-60s, slim, pleasant - and introduces us to the rest of the dinner party, which consists of his two nephews, both men close to my age in their mid-20s. The nephews are nice guys: one looks like he could be a model for Karl Kani and the other is more of an eggbert, has a Southern accent and tells us he's back from a career in the armed forces. Producer X hands me and RM Christmas presents (!) and we all sit down in the living room overlooking the sweeping Silverlake, Glendale and Eagle Rock neighborhoods. Dinner is ready. Producer X seats us in assigned placements at the table and tells his nephew, the model-looking one, to pour wine for us. We have general conversation and the wine glasses start to empty. "Would you like some more wine with dinner?" Producer X asks. I say sure and get up to bring the bottle from the nook to the table and am told, "You sit down. He'll get it for you.' This is said to model-nephew. "Go pour the man some wine!" Model nephew does as instructed. I'm only uncomfortable because we're the same age - who am I to have some dude my own age pouring me wine on command? My RM and I both have long hair. Mine is long and bleached yellow so I don't get typecast, as in Chicago, as the heavy, the gun-toter. My RM's hair is in long braids, to avoid being typecast as the Suburban dad or guy-at-the-poker-game. Eggbert nephew, the countrified one with the military career, asks me, "Is that all your hair?" I'm a guy's guy, it's an innocuous question, but before I can answer, Producer X pounds the table with his hand and says, "Now why would you ask the man that?! That's the rudest goddamned thing to ask a guest!" "I just was curious - "
"You didn't ask his roommate that? All them braids? If anyone has extensions at the table it'd be him. Why didn't you ask him?" "His looks real," Eggbert nephew says sheepishly. I laugh. "Well, don't ask again. It's bad manners. I taught you better than that. Refill their glasses while you think of something else to ask," Producer X directs while I'm chewing at a snail's pace. What. Just. Happened? Again, this guy is my age being loudly chastised by his uncle. It's embarrassing to witness. The nephews don't really talk much after that. After dinner is over, they're more talkative as we sit down to open presents. Our gifts are boxes of See's Chocolates, which was nice of him to do for virtual strangers. Eggbert nephew has gotten some nice clothes. He says he's ready to go to college now that he's out of the military. I ask him what he wants to major in. "Political science," he says smiling. "I think I'd like that a lot." "Political science?" Producer X all but sneezes with the theatrical disdain older relatives are prone to. "Man, you're going to get a degree in engineering. Something you can make money at." "But I don't know engineering," Eggbert says. "You'll learn. That's why you're going," Producer X says, ending the discussion. "He can't decide for himself?" I ask Producer X, not in a funky way, just a rhetorical question. I'm a writer, I like to ask the tough questions. "Not when I'm paying for it he can't!" Producer X replies. I decide I have no more questions, clearly this is a family matter, but at least I tried to speak up for him as someone his own age. Give Eggbert free! It's getting late, I'm ready to go. Producer X was very nice to invite us, but I can see how he talks to guys my age, thinks we're essentially broke and misguided, so there's really nothing left to really make small-talk about. Besides, he invited my RM... that's his friend, luckily. Good luck with that one! Producer X tells me I can go relax in the den. I go in the room and see the walls lined with beefcake photos of mustachioed Black men from the 1970s and the 1980s - all with that Billy Dee Williams-esque, smooth handsome look you'd see in... certain magazines?...back in the days. I don't recognize any of them as current personalities but this is either an honor roll of headshots or the greatest ever shrine to boyfriends past. RM is ready to go. I thank our host, Producer X, and warmly say goodbye to those poor nephews who get talked to like adolescents but don't seem to mind. After we get back home, me and RM talk about the night. Wasn't it weird how he ordered those dudes around? And they seemed fine with it? Maybe he raised them from infants and they feel loyalty to him? Or they're his nephews he deems most primed for his help and Svengali-ism? We can't figure it out and listen to Santana's Welcome on my boom box in the living room. Three months later I'm on Olympic and LaBrea at a hair appointment I equate with going to the vet: not pleasant, but processed blonde hair takes a village, no matter what decade. I'm taking the bus - East Coast habits die hard - and headed back home to Los Feliz. I have on a hat and glasses as I walk down the aisle and see Model Nephew, from the Christmas dinner, with a big pack of Huggies diapers in his lap. I sit down as invisibly as I can - I still feel bad for the kid and imagine him replaying forced wine re-pours in his head and resenting me for it. I hope he remembers I was glad to pour my own, had that been possible. He's on a cell phone and talking to someone, explaining how he just picked up his baby's diapers but he has to make a run first. "I'm heading up to Los Feliz. Yeah. I have this 'friend' up there. Yeah, he hooks me up after I take care of him first, ha ha. Me and a friend. He's a radiologist. Nothing major." 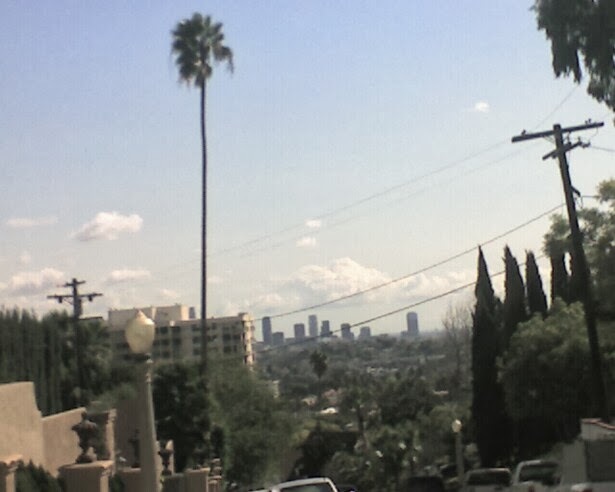 We're headed up Vermont Ave., toward Los Feliz Blvd. I get off a few stops early and hope he doesn't recognize me. He doesn't. Would Bruce Wagner appreciate this development, even if it's as old as humanity? The 'nephews' are really his paid escorts and do as they're told. RM talks to Producer X once more. Producer X is not a producer, he tells RM: he's a radiologist... but he loves the arts and beautiful men. The star on the Walk of Fame is real - it just belongs to the real producer, who just happens to have the same name, and is definitely not a radiologist. He hopes they can be friends.